It’s as if Portuguese wines were still overshadowed by Spanish wines in the general awareness, and only port is known by nearly everyone. 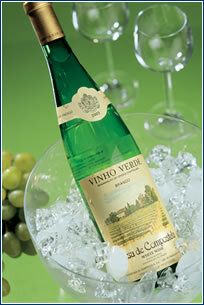 But do you know Vinho Verde? Thanks to fine technologies Portugal offers a broad range of excellent white and mainly red wines, mostly produced from varietals that don’t grow anywhere else, so their aromas and flavors are original. And because it’s summer, let’s take a closer look at a Portuguese specialty, Vinho Verde, which is ideal for warm weather quaffing. This green (also called young) wine, comes from vineyards around the town of Braga, which lies in the northernmost part of the country in the Minho wine district, or Vinho Verde. The part of the basin of the Doura river where the grapes for port are harvested is directly linked to Minho. Well-chilled Verde is truly refreshing, and its lower alcohol content allows for its “harmless” consumption in larger quantities. Surprisingly, everywhere in the world the white form of green wine is popular, while the Portuguese prefer stronger, more acidic red wine. Statistics indicate that over 80% of all Verde is red, but over 95% of exported Verde is white. Most green wines are made from grapes that are harvested before they’re completely ripe. Because they contain less sugar, a wine with lower alcohol content ferments, and refreshing tannins absent in ripe grapes are contained in it. Original Portuguese varietals are grown on vines trained two to three meters high, with sufficient room beneath them for other plants. In places vines climb freely on trees and fences, so ladders are needed for the harvest. The wine is bottled while very young, right after fermentation, which gives it a refreshing light sparkle (but usually CO2 is added). If you want to taste completely pure Verde wines, with no added “prickle”, see our Wine Guide on the following page. August 14 – from 6 to 12 pm. Special sekts matured in the water of the Znojmo dam are sampled and auctioned. Price according to consumption. August 20-21 – VII. Annual Pardubice wine festival, open 10-19, entrance fee CZK 20. Vinho Verde is available on the Czech market, too. Here are a few examples worth tasting. Characteristics: Excellent price/quality ratio. Nothing outstanding, but when well-chilled its flavor and slight carbonation are nice and refreshing in hot weather. Characteristics: A typically fresh, simple, lightly carbonated, refreshing, true “green” wine. Characteristics: The piquant, spicy tones indicate that this wine was made from the Loureiro and Trajadura varietals. 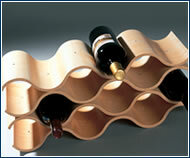 Characteristics: The only one of our sample wines to have no carbonation, yet it has the most interesting flavor. Made from the original Portuguese white varietals Azal, Arinto, and Avesso, it preserves all the merits of typical Verde wines.